Can the Congo save itself, mythical okapi from destruction? A nudge above the equator in one of the most biodiverse places in Africa lives an almost-mythical mammal that few people have ever seen. The striped okapi is often described as half-zebra, half-giraffe. (CNN) - A nudge above the equator in one of the most biodiverse places in Africa lives an almost-mythical mammal that few people have ever seen. The striped okapi is often described as half-zebra, half-giraffe, as if it were a hybrid creature from a Greek legend. So rare is the okapi, that it was unknown to the western world until the turn of the 20th century. While the okapi is virtually unheard of in the West, its image pervades life in the Democratic Republic of Congo -- the only country in the world where it is found living in the wild -- gracing cigarette packets, plastic water bottles, and even the back of rumpled Congolese Francs. The okapi is to the Congo what the giant panda is to China or the kangaroo to Australia. But decades of misrule under a succession of dictators has seen much of the Congo's natural resources spin out of the government's control, and okapi numbers fall by 50% since 1995. Three decades ago, an American scientist made it his life mission to protect this rare mammal by co-managing the Okapi Wildlife Reserve in eastern Congo. The reserve is roughly the size of Yellowstone National Park, in the United States, but that's where the similarities end. The Okapi Wildlife Reserve is among the most dangerous places on earth to visit. Armed militia stalk the dirt roads, illegal gold and diamond mines operate with near impunity and ivory poachers are rife. Compounding matters, the region is currently battling the country's worst Ebola outbreak to date. This week, as the country accepts opposition candidate Felix Tshisekedi as winner of a disputed landmark election, the nation stands on a precipice. The okapi's fate, once again, rides on the country's next move. When 37-year-old John Lukas touched down in the capital of Kinshasa aboard a rickety cargo plane in the late 1980s, the Congo was a very different place to the one he navigates today. This vast nation that spans two time zones had not a single road joining east to west. But under military dictator Mobutu Sese Seko, the flamboyant leader famed for his leopard-print hats, life was relatively stable, says Lukas. After independence from Belgium in 1960, hope was in the air. "Under Mobutu, any person in the Congo could go anywhere safely," he says. "You never felt threatened." A Florida-based zoology graduate, Lukas had been leading Big Game safaris in eastern and southern Africa for years, but there was one strange animal he had seen in American zoos and longed to admire in the wild. About the size of a horse, the okapi is a close relative of the lanky and long-necked yellow giraffes we know today. "It is amazing biology," says Lukas. The okapi can lick the back of its own neck with its 18-inch tongue, and its glossy coat feels like velvet. Most newborns of any species defecate within 12 hours of birth, says Lukas, but okapis hold their first stool for 60 days, to avoid giving leopards a scent to hunt. An okapi can twitch each ear independently. In 1987, he arrived in Epulu -- a seven-day overland journey from Goma, a city in the east -- with a group of talented conservationists. In the 1980s, the Congo had an active Ministry of Environment serious about protecting the country's natural bounty, and Lukas' group worked with ministers to promote the country's national animal. In 1992, the Okapi Reserve was officially recognized by the government. Under Mobutu, this part of the Ituri Rainforest had been earmarked as a mineral reserve, to protect future mining opportunities. As a result, it was virtually free of development, providing the ideal habitat for the reclusive okapi. "Our mission from the government was to ... make Epulu known for the okapi. To let people see the animal," says Lukas. Felly Mwamba, a trader who was born and grew up in Kinshasa, explains that while everyone in the Congo knows what an okapi is, most people have never seen one in real life. "Many years ago, I saw one in Kinshasa Zoo," Mwamba says. "But they aren't there any more." Joining Lukas were Congolese conservationist Jean N'lamba, Swiss zoologist Karl Ruf and his wife, former office worker Rosmarie Ruf, who had followed her husband to Africa, as well as officials from the Congolese Wildlife Authority (ICCN). It was not a life-threatening mission. 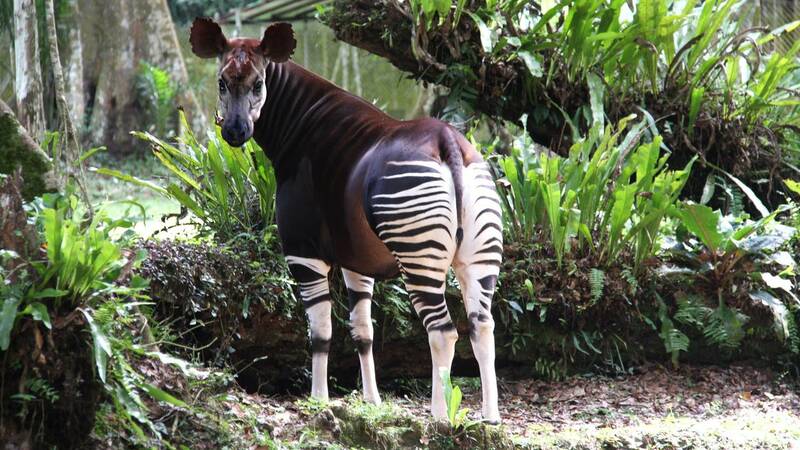 The okapi was not an endangered animal. The West got its first whiff of the okapi in 1890 when Welsh journalist Henry Morton Stanley had puzzled over a strange "African donkey" in his book. After the British government declined to fund his exploration of the Congo, Stanley was approached by King Leopold II of Belgium, who was eager to exploit Africa's wealth. Using forced labor, Stanley oversaw the backbreaking construction of roads across the Congo, helping Leopold claim the territory as a private fiefdom. Congo was 76 times the size of Belgium, and Leopold got rich off its ivory and vast rubber reserves without ever stepping foot there. Scant investment was made in the Congo or its people, and by the time the Belgian government took control from Leopold in 1908, millions of Congolese had died or been mutilated: One particularly barbaric act saw locals who failed to meet their rubber quotas punished by having their hands chopped off. In the early 20th century, the roads that rapacious colonization had built now ferried a trickle of adventurous visitors from the West across the territory. One such tropical tourist was Harvard-educated Patrick Putman, who in 1933 alighted in the eastern Congo and opened a small hotel and a roadside zoo in Epulu, where he lived with a succession of American and African wives. It was the first time okapis had been domesticated in Epulu. "They were a novelty to Western people," says Lukas. Previously, it was believed the okapi was a new species of zebra. It was only later, when okapi skeleton was analyzed, did naturalists realize they had a giraffe on their hands. Putman died in 1953 and seven years later the Congo gained independence, sparking a civil war that overran the area. All 26 okapis at the base wandered back into the Ituri rainforest. In the early 1990s, the Okapi Wildlife Reserve was a little nook of paradise. Slim sunbeams filtered through the canopy beaming patches of light onto the forest floor. Tree pangolins scaled giant trunks, forest elephants trundled safely along, tropical birdsong wafted on the breeze. "Once you were in, there was no communication with the outside world," says Lukas. "You would write letters home and hopefully somebody wrote back." Everything in the camp, from wire fencing to microscopes, had to be flown in to Epulu, a village located inside the rainforest but just outside the reserve. In the first half of the 20th century, the Belgians had airlifted animals from Epulu to Antwerp Zoo, where in 1957 the first okapi was born in captivity, enabling other foreign zoos to take stock. By the 1990s, the gene pool of the global zoo population was slim and failing. Now Lukas' group dug pits along okapi trails to capture animals to breed at the base, and three babies were born: One female and two males. "We sent those calves around the world," Lukas says. "They had lots of offspring." The roughly 200 okapis in zoos in New York, Chicago, Dublin, and Tokyo today are largely descend from that trio. Lukas split his time between Congo and Florida, where he drummed up dollars for the reserve and conducted ground-breaking scientific research. Using NASA-provided sound-boosting technology, his team gathered data that helped prove okapis communicate via infrasonic noises imperceptible to humans. "It's quite dinosaur-like," Lukas says. But as the team's work thrived, the Congo was becoming a shadow of a state. After rising to power, Mobutu had renamed the Congo Zaire, cloaked himself in leopard skin and drained the country's coffers, buying off his enemies to maintain stability. His sleepy birth town of Gbadolite in the north, was turned into a lavish city, nickednamed the "Versailles of the Jungle." Replete with Western-style malls, supermarkets and a five-star hotel, it also featured three opulent palaces with Louis XIV furniture, Italian marble and illuminated fountains. In 1985, Gaston Lenôtre, then the world's leading pastry chef, was flown in to Gbadolite aboard Concorde with a birthday cake for Mobutu. The country had, once again, been robbed. In 1997, while Mobutu was getting cancer treatment in Europe, Laurent Kabila marched into Kinshasa and took over the country. The coup divided the region. Kabila had used Rwandan-backed soldiers to win power, on the condition that Hutu rebels, who had committed Rwanda's genocide and were now hiding in the Congo, would be returned home to face justice once he assumed power. Kabila defaulted on that promise, and sparked the bloody conflict that came to be called Africa's First World War. Rwanda and Uganda sent anti-Kabila soldiers into the Congo, while Angola, Namibia and Zimbabwe propped up the government. Millions of lives were lost, mostly from disease and hunger, and infrastructure in the east of the country was decimated. Kabila was shot dead by his body guard half way through the war, and his son Joseph Kabila took power. "The bad governance Joseph Kabila inherited from Mobutu, he sophisticated and adapted to a more globalized world," says Kris Berwouts, a Kinshasa-based author of several books about Central Africa. From 1999 to 2002 alone, the Kabila regime transferred ownership of at least $5 billion of assets from the state-mining sector to private companies under its control, according to the United Nations. When the war ended in 2003, on a local level the state evaporated, says Berwouts. Hospitals were places people went to die, the state provided no education. "The state simply does not exist anymore," he says. "Which leaves the field to armed actors." During those warring years, Lukas became something of a diplomat. "There were several rebel groups, as well as the Rwandan and Ugandan armies, and the Congolese government, fighting back and forth over territories in the eastern Congo," Lukas says. "We'd be negotiating with whoever was in control for the safe passage for our workers." In 2003, Karl Ruf, N'lamba and Kambale Saambile, a rising star in the okapi project, had just struck such a deal with notorious war lord Jean-Pierre Bemba. On the drive home from the successful meeting, an out-of-control bus collided with their car on a mountain pass. "In one blow, we lost our three top people," says Lukas. Karl's wife Rosmarie was in Switzerland. "It was a disaster," she says. Rosmarie decided to take over her husband's legacy and manage the reserve. "I knew I could not stop doing it," she says. "My husband would be not happy if I left the Congo and gave up." As state institutions collapsed, the Congo's population had boomed. There are an estimated 80 million people in the country, but the last census was in 1986. Today, the number is surely higher. Ruf says people increasingly began moving onto the reserve, either to practice slash-and-burn agriculture, poach or mine, putting okapis under threat. The government deployed rangers to protect the area, and Lukas topped up their salary of $43 a month with bonuses for each collected snare or completed patrol. Jean Paul Monga, 40, has been a ranger at the reserve since 2001. Ten years ago, he says, rangers might have encountered small groups of four or five poachers. "Today, you'll find gangs of 30 or 40 people hunting inside the reserve," he says. "They are determined. They want to get ivory and, if you come across them, they will open fire." Closing down mines and poachers, however, is a delicate matter in an impoverished country where employment opportunities are virtually non-existent. Neighboring Rwanda, now considered a beacon of African stability, has turned its mountain gorilla population into lucrative tourism dollars. A trek with a mountain gorilla in Rwanda costs $1,500, and tourism accounts for 13% of the country's GDP, providing Rwandans with an incentive to support conservation. Congo also has mountain gorillas in Virunga Park, just south of the Okapi Reserve, but after two British tourists were kidnapped there last year, the region is considered too dangerous for a viable tourism industry. "We get one or two tourists coming through," Lukas says. "I don't know if they're brave or stupid." In 2012, the Okapi Wildlife Reserve experienced its worst attack, when armed rebels stormed the Epulu station. All 14 domestic okapi at the base died, buildings were torched and 100 people were kidnapped, the men used as porters, the women taken as wives. The rebels thought the reserve was finished, says Rosmarie, but her team persisted. "The beautiful places are now filled with armed groups who live beyond state control and only have that for feeding themselves," Berwouts says. Okapis have not been kept at the Epulu station since. On December 30, 2018, Congo went to the polls. The national constitution stipulates a two-term presidential limit, and having overstayed by two years, Kabila was finally getting out the way of democracy. It was set to be the country's first peaceful democratic transfer of power. Lukas and Ruf waited out the drama from Florida and Switzerland, respectively. It was a landmark moment for the Congo. And it went awry. The country's influential Catholic church's 40,000 election observers found that Martin Faylul won. But opposition candidate Felix Tshisekedi was declared the winner amid widespread irregularities and allegations of rigging. "Kabila is very smart and he knows how to work the system," says Lukas. "He wants to run again in 2023, and he wanted to keep the party in control." On January 19, the Constitutional Court validated the results of the election, despite requests from the African Union to delay swearing in a new president while they investigated. In Epulu, the internet has been turned off for weeks -- a government move to stem unrest -- and Ebola remains about 200 kilometers from the reserve, having now claimed more than 400 lives. Lukas is determined to hold the line, waiting for an upturn in the Congo's fortunes that has proved to be as elusive as the okapi. He is plotting to expand his project to Maiko National Park to the south, where rebels are winning over conservation. "It's a spectacular place with bongo antelope, okapis and gorillas," he says. "Nobody can go there, it needs our help. I don't have much time left, so I'm going to spend every moment making a difference." Meanwhile, the 50 cent note that okapis so gracefully decorate is now so worth little in the Congo's devalued currency system that it is out of circulation.